Since the launch of the Galaxy S8 and S8+ devices, several users started talking about how they can Remap or Use the dedicated Bixby button to launch the Google Assistant on the Galaxy S8 and S8+ and as a solution to this we find a free application called All in one Gestures, available on the Google Play Store. So, let’s see how it works, I have lined up a few steps down below which you can follow to Remap or Use the Bixby Button to launch the Google Assistant on you Galaxy S8/S+ devices. 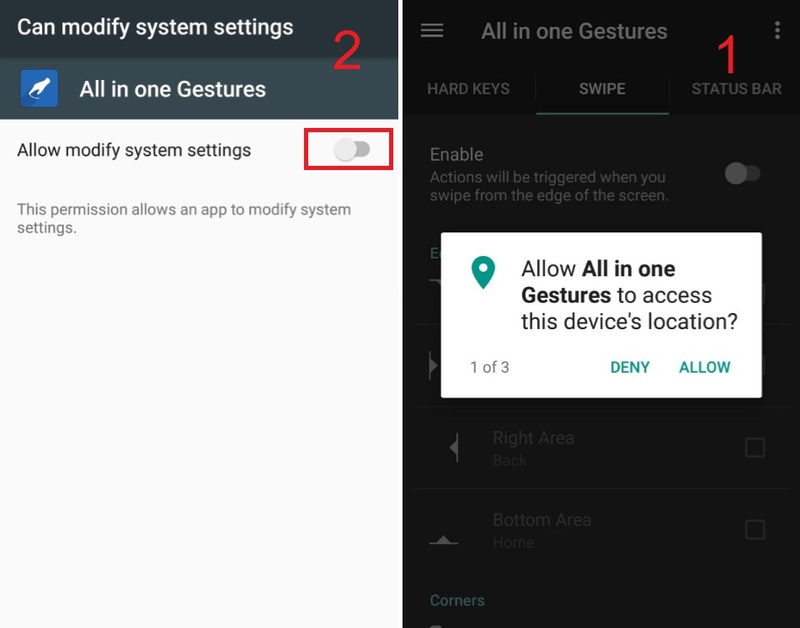 1- To start the process you will first need to download and installed the All in one Gestures app from the play store. Once you’ve got the application installed, open it up, now it will ask you to grant it access to modify system setting, remember, doing this is not necessary, but granting would be better. 2- Now on the main screens on the app, swipe over to the left screen now tap on the “Hard Keys“ tab then tap ‘Enable’. Now a screen will prompt on the bottom asking you to enable All in one Gestures’ Accessibility Service. Tap on the button to go to the Accessibility Settings screen. Scroll down to the bottom and look for “All in one Gestures” under the Services section. Tap on that and then toggle the OFF button to ON, that will enable All in one Gestures’ Accessibility Service. 3- Now go back to the All in one Gestures app home screen, now Tap on the menu button in the top right-hand corner you will see an option called Custom Keys, tap on that and now you will see an Add Custom Dialog box, now press the Bixby Button pressing the Bixby Button will open up the Bixby Assistant, now just go back to the home screen of All in one Gesture app. 4- Once you go back on the home screen you will find a newly added option labeled as Custom Keys field with a key code number 1082 just below the Volume option. Now, this number represent the Key Code that is sent by the Bixby Button when it is pressed. Now press Add to have All in one Gestures add it as a Key Code for Bixby Assistant. Now, our All in one Gestures app is ready to launch application/shortcut of our own choice. To Start, select the circle box next to the Key Code #1082 under the Custom Keys section which will bring up another dialog box that puts you first on the Action tab. From here tap on Search from the list, now the Search options will pop up, now just select Voice Search. Once that’s done, you should see “Voice Search” under the Key Code #1082 in the Custom Keys section of the app. Once you are done creating the first Key Code under the Custom Keys Section, you can technically launch almost any application/shortcut of our own choice. Let’s say you want to launch Google Now instead of Google Assistant! don’t worry its easy, you just have to go to the “Hard Keys” screen in All in one Gestures and tap on the Custom Key you have just created and it will open up the configuration dialog once more, now this time go to the Application instead of Action tab by navigating towards the left, Scroll down the list and look for Google and add it to the Custom Keys section by tapping on it. Now this way you change the functionality of Bixby button to launch Google Assistant to Google Now or any other app. If you find this tutorial helpful then share it with others. I hope this tutorial will help people who have been looking to find a way to remap or use the Bixby Button to launch the Google Assistant/Google Now. You can just drop a comment down below if you find any difficulties in doing this.